Performers include: Mary Elizabeth Winstead, Danny Pino, Aaron Tveit, Tony Shalhoub, Nikki M. James, Johnny Ray Gill, Charlie Semine, and Jan Maxwell. Created by Robert and Michelle King, this comic-thriller TV series is set in the world of Washington, DC politics. 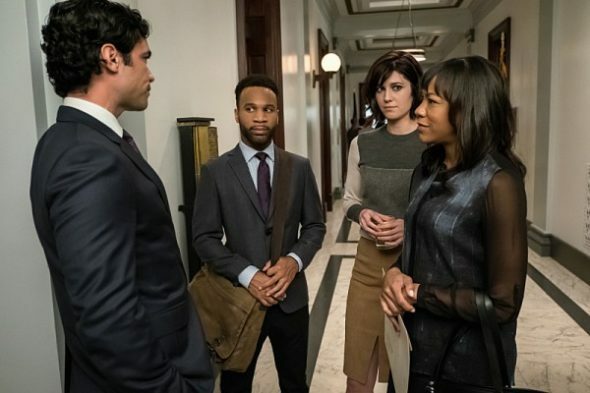 Fresh-faced, Laurel Healy (Mary Elizabeth Winstead) has returned home to Washington, DC to work for her brother, Senator Luke Healy (Danny Pino) on Capitol Hill. The daughter of a Democratic political dynasty who left the area to become a documentary filmmaker, Laurel is pulled back into the family business when her brother, the Democratic whip Senator from Maryland, needs her help running his Senate office. On the Hill, Laurel becomes unlikely friends with Gareth (Aaron Tveit), the smart, hardworking Legislative Director to a top Republican, Senator Red Wheatus (Tony Shalhoub). One of Laurel’s allies, Gustav Triplett (Johnny Ray Gill) is an eccentric genius who is the first in DC to recognize that something sinister is attacking the Capitol. There’s also Rochelle (Nikki M. James), a medical student who teams up with Laurel and Gustav to protect and defend the citizens of DC from an untimely fate. Other characters include Anthony Onofrio (Charlie Semine), and Senator Ella Pollack (Jan Maxwell). As the tiny bugs continue to multiply, Laurel and her allies must work quickly to identify the creatures, stop their infiltration and ultimately save the world. Laurel discovers the secret to driving the bugs out of a person’s brain and tests the tactic on her father. Armed with new knowledge, Laurel and Gareth attempt to expel the Queen bug out of Red’s head once and for all. First aired: September 11, 2016. What do you think? Do you like the BrainDead TV show? Do you think it should have been cancelled or renewed for a second season? BrainDead: Cancel or Renew for Season Two? Great Show that shows why and how politicians change their minds with ease? Continue the show!!!! It’s always the shows I enjoy. Making fun of the government. C’mon and the lead actress. Excellent job. Sorry to see you all go.